Family contests, corporate show for children, party, birthday celebration events and dates, presentation – all these and any other events we offer you to organize and hold in the Palace of Sports . If you are looking for a suitable hall for presentation or the solemn celebration of the anniversary of the company, if you are already tired of the standard parties in restaurants and cafes, then welcome to contact us! 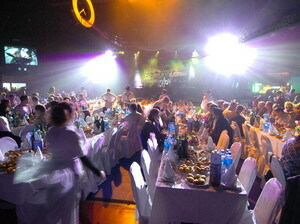 Banquet for 700 people is available directly on the playground!